I’m all out of whole wheat pastry flour (my favorite), so I decided to get creative and create a gluten-free/higher protein bar variety. These are made using quinoa and ::drumroll:: garbanzo bean flour! Yes, I’m serious. And they’re good, too! :) Just don’t taste the batter. Raw garbanzo bean flour = nasty tasting. Trust me. Note: You’ll need to either have some leftover cooked quinoa on hand, or cook some up before you start this recipe. One cup cooked quinoa is equal to roughly 1/4 cup uncooked. Prepare with water according to the instructions on the box. Be sure to let the quinoa cool afterwards. 1) In a large bowl, mix dry ingredients. In a separate smaller bowl, mix wet ingredients, except for chocolate chips. 2) Add wet to dry, stirring gently until mixed. Add in chocolate chips and mix. 3) Poor batter into a baking pan — I used my 7×11 pan (about 2 inches deep), but you can use whatever size you have. 4) Pop it in the oven and bake about 28 minutes — fork check to make sure they are done. Previous article: Walleyball: Making Exercise Fun! Yumm! 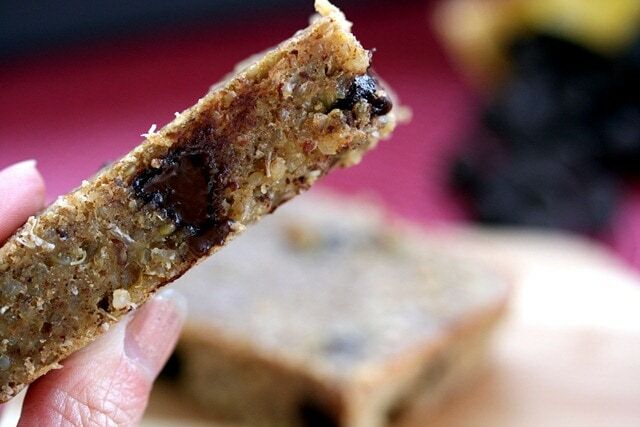 I absolutely love quinoa and the idea of baking it into a protein bar is beyond awesome! Plus, it is hard to go wrong with dark chocolate! Definitely bookmarked for future reference. Those look awesome! I just wrote about cooking quinoa for the first time! I bought a 4 lb bag at Costco, so I definitely need fun recipes. This one looks incredible! :-) I want to make it this weekend! What a great recipe! I will need to make it soon. These sound delicious! 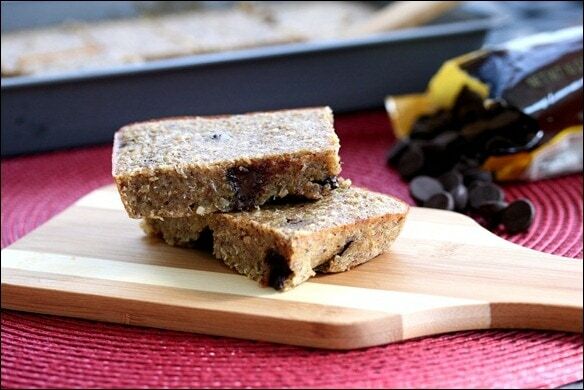 I love the thought of quinoa in a bar. Pinning these!! These look good! I definitely want to try them. Can I sub regular whole wheat flour for the chickpea flour or does it need to be whole wheat pastry flour? I’m not sure of the difference. Thanks! What about oat flour? My sister is GF but doesn’t like garbanzo bean flour at all! Yes, I bet that would work well too! Thank you so much for posting the recipe! This is on my list for the weekend. I love how you come up with the concept and do all the testing – and I get to reap the rewards! Thanks for making my life so much easier! Oooh these look like a good one to try! I’ve never used garbanzo bean flour before, but have always been curious. These look awesome! I’m a big fan of garbanzo bean flour in my baked goodies… I’ve made chocolate muffins with it hidden in. Great recipe!! I love it when quinoa is added to a recipe! :) And of course dark chocolate. These look super yummy! Can’t wait to make these, I’m on a quinoa run at the moment! Getting my hands on garbanzo flour will prove more than a little difficult in Ireland…even getting spelt is hard enough, but I’m on the hunt! How long do you think these would stay good in the fridge for? Also, do you think they’re freezable? Hmmm maybe about a week max in the fridge? 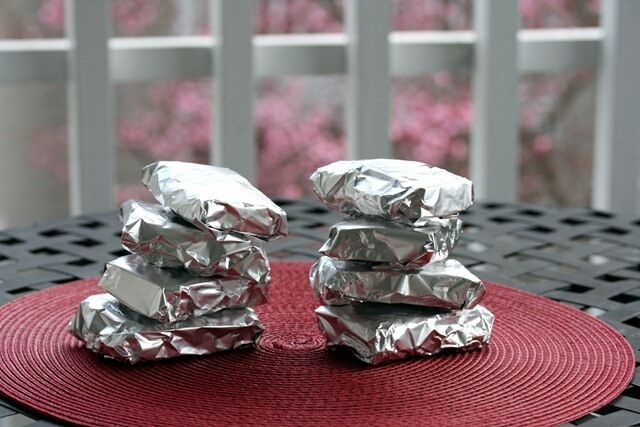 And yes they are definitely freezable – I’d wrap them individually in tin foil and then put them all in a big ziplock. These look so good, I’ll have to try them out! I also love that they are gluten free! I use garbanzo bean flour ALL the time (mostly because it’s the cheapest GF flour I’ve found!) and I love it because it’s pretty light! This is only the second time I’ve used it but I’m a big fan as well! These just came out of the oven & they are soooo good! That would be an understatement. 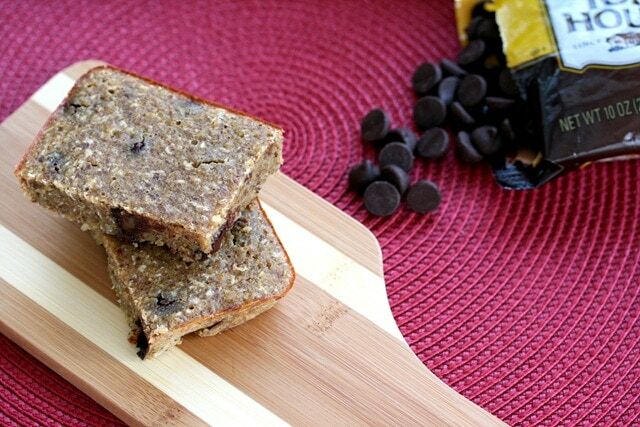 I used a “Chia Egg” because I’m allergic to eggs and then I was out of dark chocolate so I used white and decreased the sugar a bit since they would be sweeter, but amazing recipe! Heh – fANNEtastic test kitchen. Love it! I’m so glad you posted this! I’ve had a bag of quinoa in my freezer for weeks that I’ve been wanting to use up and this was perfect. Mine didn’t set enough to make nice bars out of but I put some in an almost empty peanut butter jar last night and it was so delicious. I think I know what I’m eating for breakfast for the the week. Since I teach in a public school where several students have nut allergies I can no longer bring in my favorite snacks of mixed nuts or peanut butter. 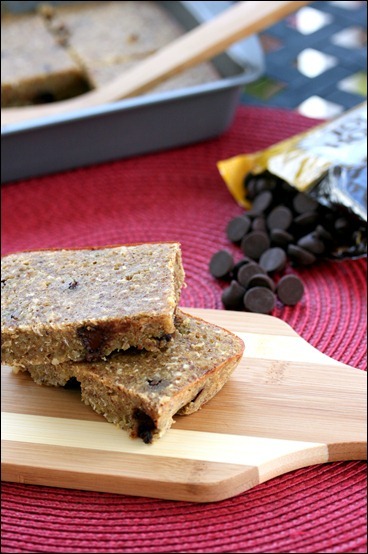 These look like the perfect snack to have on hand in my office! Mmm I love how dense these look–almost blondie-esque! I just made these and they are GOOD! Thanks Anne!! These look awesome! What would you recommend if I don’t have any ground flaxseed? I’ve done some googling and see ground flaxseed can be subbed for a lot of things, so I’m not sure what equivalent I could/should use. Thanks! You can probably just leave it out, or if you have chia seeds or dried coconut those would work too! Great recipe! Thanks for sharing. I just made them with Whole Wheat Pastry flour. I added raisins, cranberries, and chia seeds. They are very tasty. 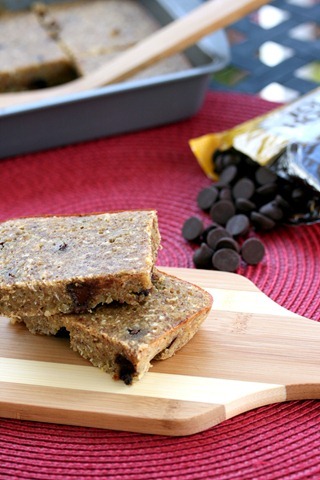 Perfect for a breakfast on the go! Loved this recipe! Made them and shared them with some non-GF cookie eaters and they liked ’em enough to ask for more! I’d like to make these with a sweetener other than cane sugar. Any suggestions? I’m not sure either. Maybe date sugar? I would just give it a try – experiment and see what works… and then let me know! Sorry I couldn’t help… I’d have to do some trial and error! I’m allergic to cane sugar and I’m going to try using Palm sugar :-) Can’t wait to try them! I am in the process of making these right now! NM- should have read all the previous comments…saw your response about the oat flour. Millet flour works really well. Did you figure out the nutritional values? No, I didn’t. If you calculate it, let me know and I’ll add it to the recipe page! I love these and keep them in my freezer to grab and take to work. Finally went online and calculated the calories and fat….for 10 servings, it’s about 223 calories and 6.3 grams of fat for each. Great, thanks for letting me know! Thanks for this recipe and I’m so excited to follow your blog! Yay – so glad you liked it! Welcome to the blog! Absolutely scrumptious and fun to make! I doubled the recipe and it fit a 9×13 pan beautifully. I also had to double the cooking time and do a few blasts at 375 degrees to get the center to cook. A very resilient batter! I was afraid the edges would overlook, but everything evened out and was perfectly moist. One surprise was how thin the batter is. It didn’t stick to bowl like cake batter; it was more the consistency of pancake batter. I was worried I had done something wrong! But after a few minutes in the oven, I could tell all was OK. Kind of like bread pudding. DH and I don’t eat many sweets, and we found that half a serving was quite satisfying. Thanks, Anne, for putting the occasional treat back in our lives! Also, I’ve tried the “flax egg” before in vegan recipes and it’s worked great! Has anyone put the calories together for this one yet? If not I can do this one. I have all the ingredients from a previous time doing this recipe. If I try any of the other ones, I’ll keep this in mind to post the calories etc for it when I do it. P.S. 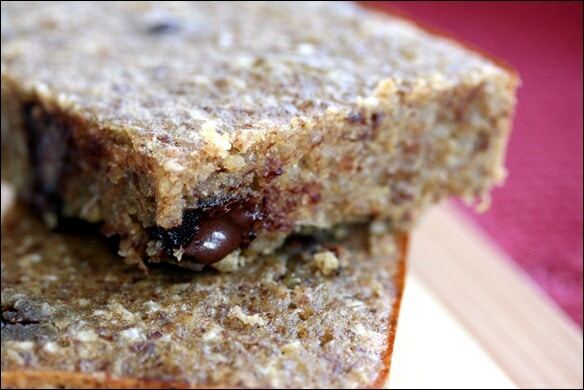 My coworkers love this one as much as the Cranberry-Peanut Butter bars. These look soo good! I can’t wait to make them. I’m wondering if you could incorporate a Banana in there somewhere? I have a few bananas that are on their last leg and need to be used! Could coconut flour be used instead of the chickpea? I’m avoiding all beans and legumes. I’m not sure – give it a try and let us know! I also added a ripe banana. This still turned out good even though I strayed far from the original recipe. This recipe is a for sure keeper. Thanks again! Can I use applesauce instead of sugar? I prefer to use natural sugars. Thanks! You can give it a shot – let us know if it works! this was delicious! made it for breakfast just this morning. perfect texture, so healthy yet satisfying! and there isn’t any fat added (plus point). thanks for this recipe and looking forward to more fat free recipes! Has anyone tried making these with stevia? I would be interested to see if they turned out..
Looks good. They are in the oven right now. 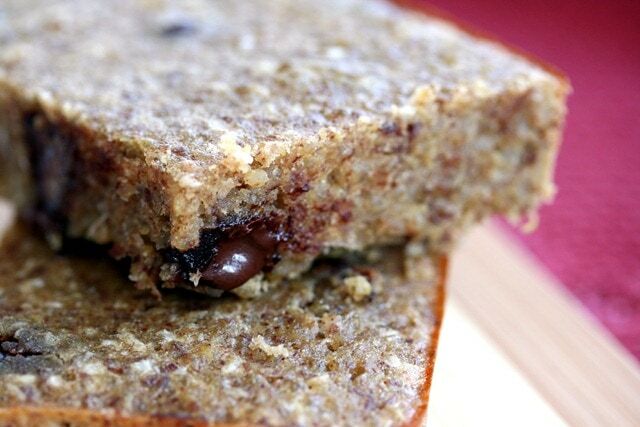 I used coconut sugar and added a few cranberries/dried, coconut flakes reduced the sugar, and used sesame seeds instead of flax. Hope they come out. Thank you so much for all the recipes ! Then I made small balls with it (I think it stick better together in balls than in bars), keep in fridge, and that’s it ! Great! Glad it worked out!